A traditional Korean appetizer. My mom’s recipe! Yellow pickled daikon radish (Danmuji). Pre-cut slices available in your local Korean or Asian market or make your own Danmuji with a quick pickling technique: How to Make Danmuji at Home. Bamboo rolling mat (if not available, can use aluminum foil). Wash rice and cook in rice cooker. If you don’t have a rice cooker, use a pot and boiling water. Place washed rice in pot about 3/4 full, pour water about an inch above the rice, and boil covered for 30-40 minutes (until all water has evaporated). Remove rice from heat. Season and stir in sesame seed oil and salt. Set aside. Blanch spinach (briefly immerse in boiling water, stir, then quickly remove from heat). Drain then rinse with cold water. Squeeze out remaining water from spinach, season with sesame seed oil and salt. Set aside. Scramble eggs in bowl. Pour eggs in a non-stick frying pan oiled with sesame seed oil. Cook eggs on medium heat. Flip over (like a pancake). Remove from heat. Slice eggs in long thin strips. Julienne peeled carrots and spam (slice in long thin strips). Sauté carrots in oil for a few minutes until medium soft (don’t overcook). Place a sheet of seaweed on top of a bamboo rolling mat (or aluminum foil). Place a thin layer of seasoned rice on top of seaweed. Layer must be spread evenly. Leave about a cm on the bottom uncovered, and about an inch uncovered from the top. Line up the strips of daikon radish, carrots, egg, spam and spinach neatly together in tight rows. Slowly fold the seaweed over, squeeze and roll tightly. Roll away from you, applying firm pressure to make tight rolls. Remove roll from mat, place on cutting board and cut with a sharp knife (approximately 8 pieces per roll). **If you make too much, store in fridge overnight. 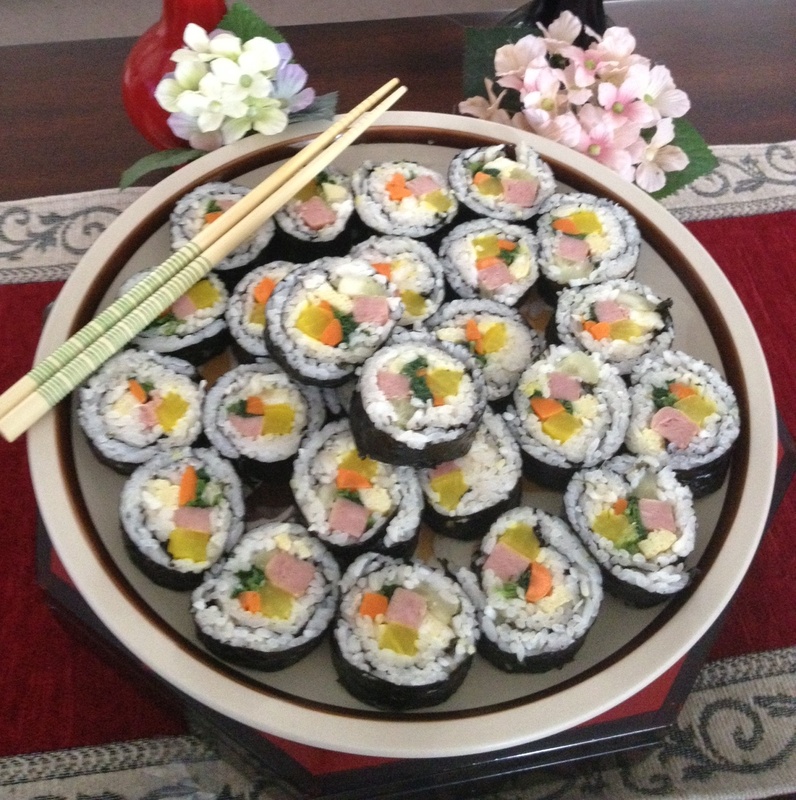 Then the next day, dip kimbap in egg, then pan fry over the stove top for a new, warm snack!